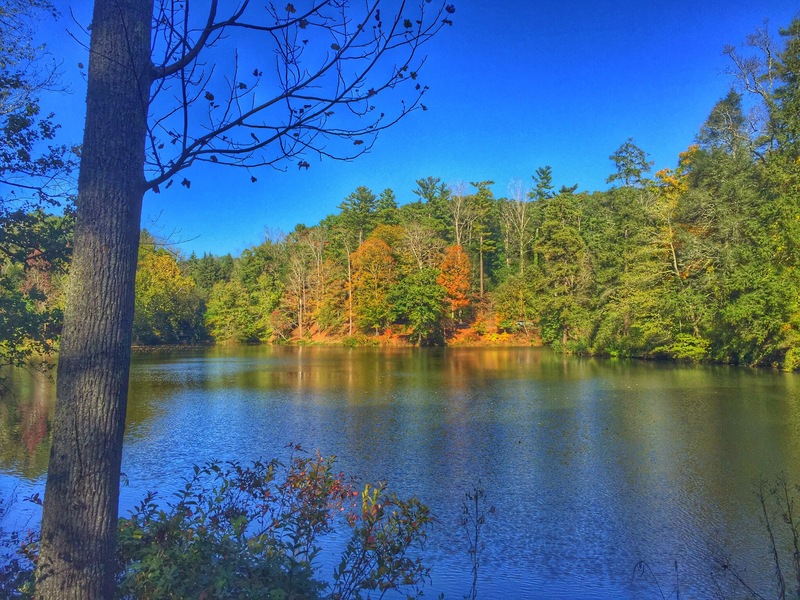 This time of year the trees are cooking up a feast for our eyes. It’s exhilarating. Reds, oranges, yellows mixing with the year’s last shades of green. With that comes a drop in temperatures. That tends to inspire soups and stews, but I let it feed a desire to use color in my creations. The other night our friend came over for dinner. We always lean toward hearty Italian dishes. I love a big bowl of spaghetti and meatballs, don’t get me wrong. But my partner in cuisine crime and I had just been to the mountains where Fall was blooming. 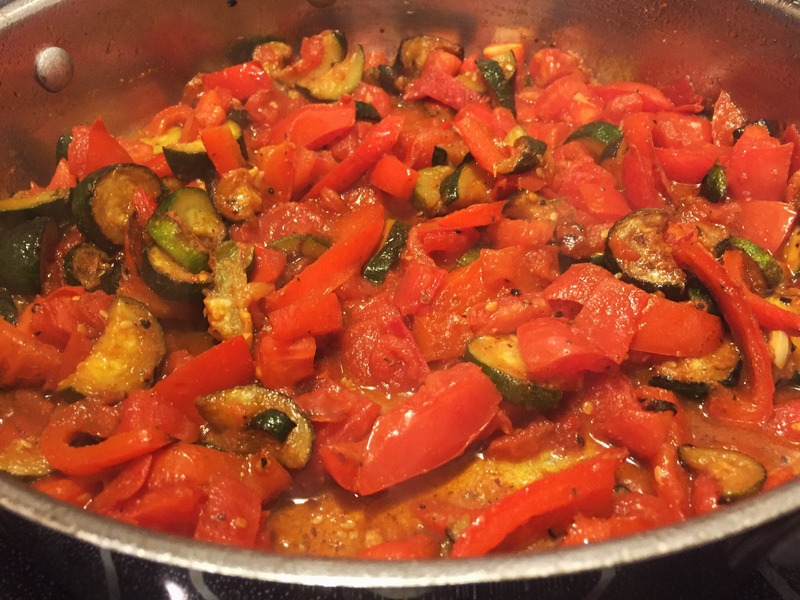 My mind meandered toward the butternut squash and Roma tomatoes on my counter and the red peppers and zucchini in the fridge. 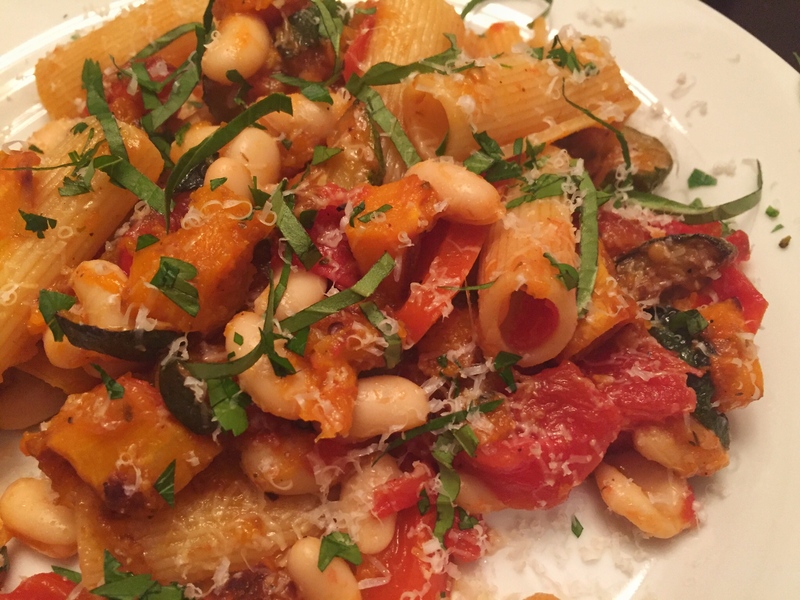 Add in some rigatoni and you have a seasonal show of color on the plate! 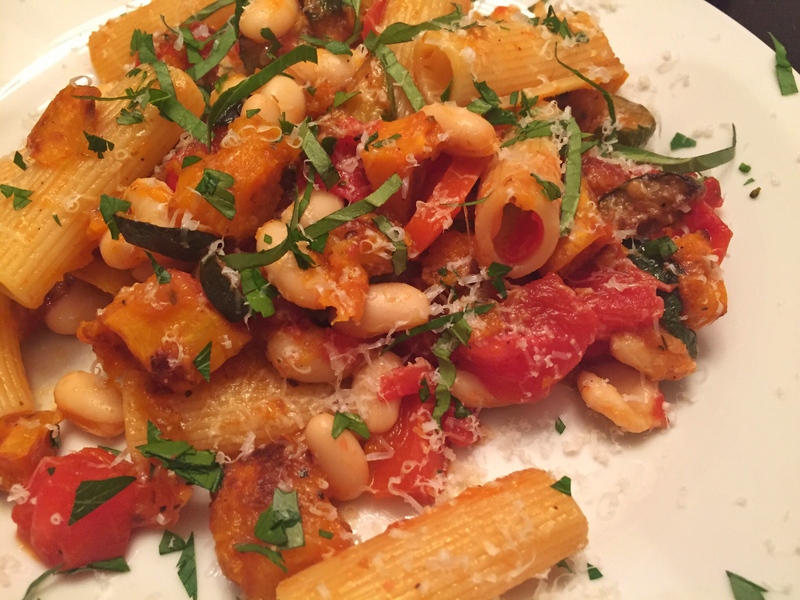 I also added cannellini beans for a bit of texture and protein, since this is a vegetarian dish. Prepare the butternut squash. First, cut the stem off. Then cut the bulb off. So you’ll have two pieces, the neck and the bulb. Cut the neck in half lengthwise, then cut each half in half lengthwise. 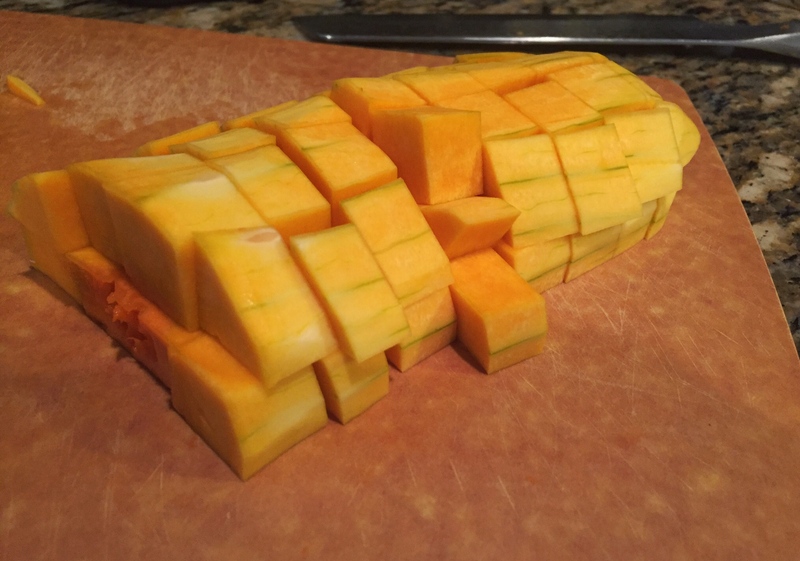 Cut each half into cubes. Cut the bulb in half. 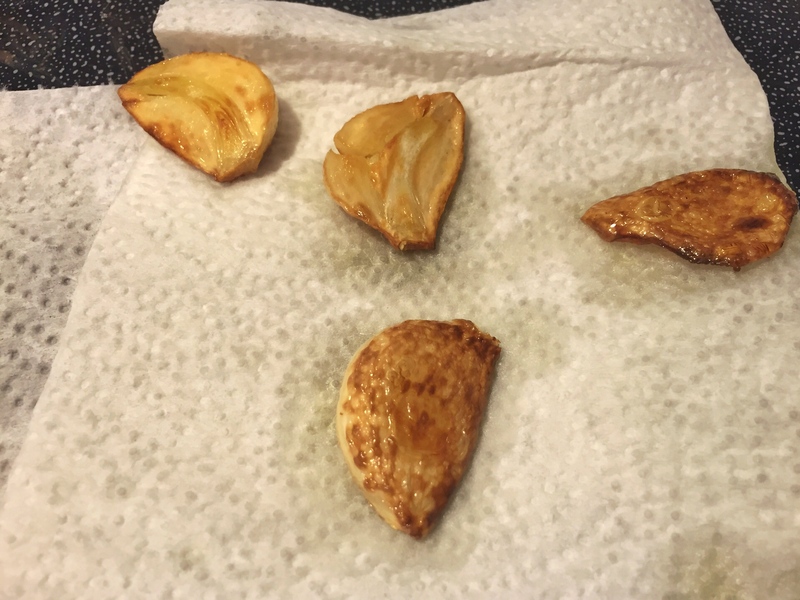 Scoop out the seeds, and roast them for a snack if you’d like. Cut each half of the bulb into cubes. Put all the cubes on a cookie sheet lined with non-stick foil, or sprayed with non-stick spray. Drizzle on one tbsp. of the oil and sprinkle on a generous pinch of salt and pepper. Use your hands to toss. Roast the cubes for 20-25 minutes, flipping the cubes halfway through. They’re done when golden on each side and easily pierced with a toothpick. 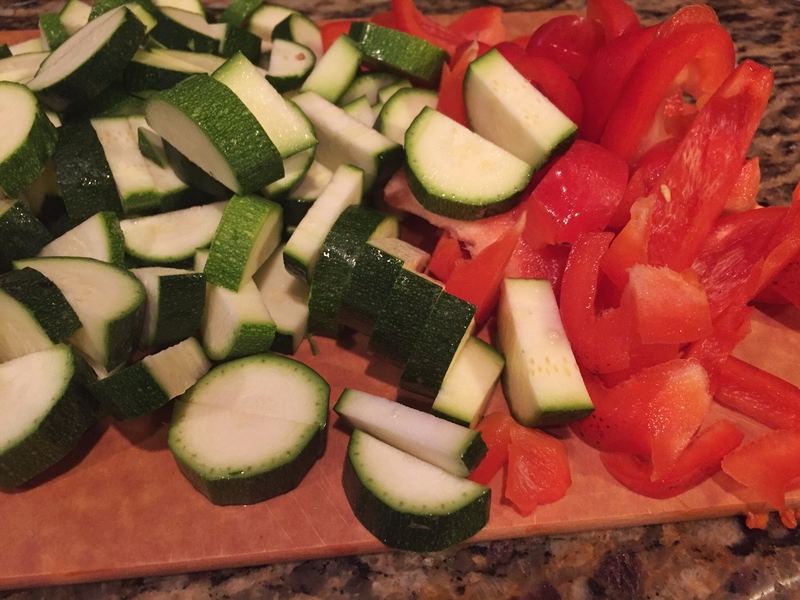 While the squash roasts, cut the zucchini into half moons and slice the pepper. Put a large pan over medium-high heat and add the remaining 3 tbsp. oil. Peel each clove of garlic and slice them half lengthwise. Add the halves, cut side down, to the oil. Cook for about 2 minutes per side or just until the cloves are golden. Remove them before they burn. 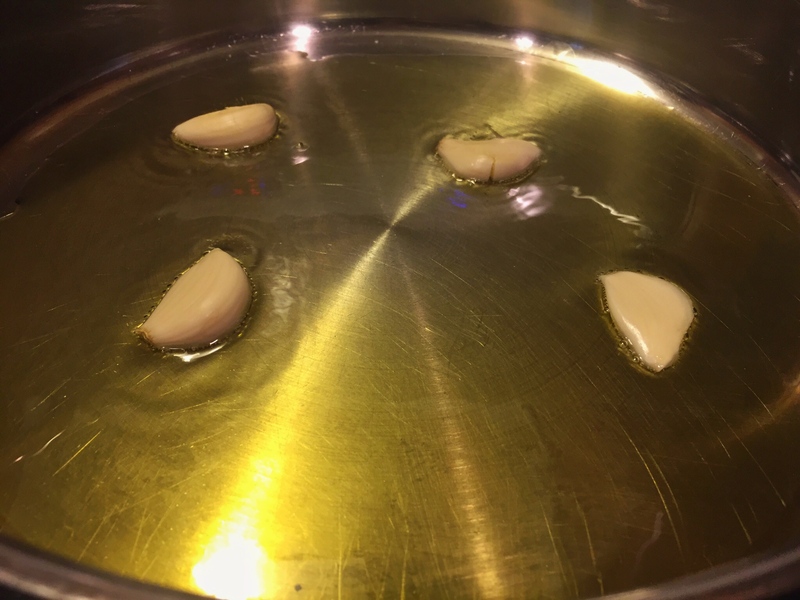 In other words, the garlic infused the oil with its flavor. Now add in the zucchini and bell pepper. Toss in the oil. Add salt and pepper. Cook for about 7 minutes or until the vegetables soften and start to brown. In the meantime, dice the tomatoes. Add the oregano, red pepper flakes, and garlic powder. Stir. Cook, stirring frequently, while you cook the pasta according to the package instructions. Remember to salt the water. When the pasta is done, reserve a cup of the cooking liquid and drain the pasta. Add the cooked butternut squash and the drained/rinsed beans to the pan of vegetables. Stir. Toss the sauce with the pasta. Add 1/2 cup of the pasta liquid and stir. If the sauce is too thick, add the remaining cooking liquid. Garnish with ribbons of basil and chopped fresh Italian parsley. I like to add freshly-grated Romano cheese, too! Look at this food! I can’t get enough of the colors! The butternut squash is sweet. There’s a bit of heat from the red pepper flakes. The bell pepper has a bit of a bite. 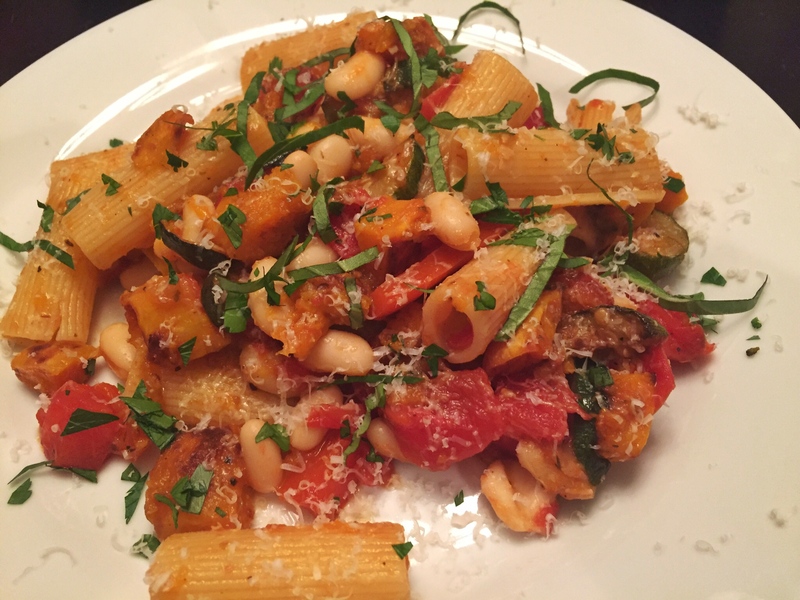 This meal tastes even better because the squash, tomatoes, bell pepper and zucchini came from our farmers’ market and the basil and parsley came from our yard. So fresh! You could easily make this on a weeknight. 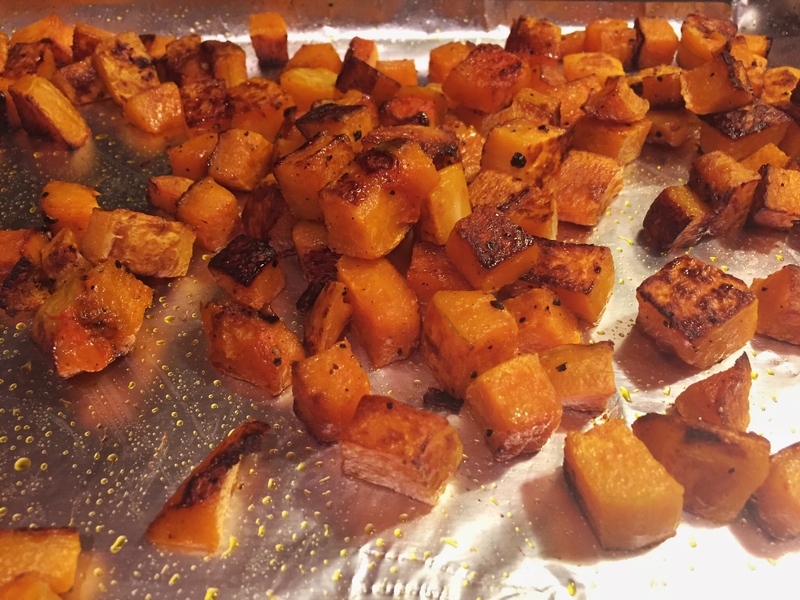 Roast the butternut squash in the morning before work (call me crazy, I know) or do it the night before. 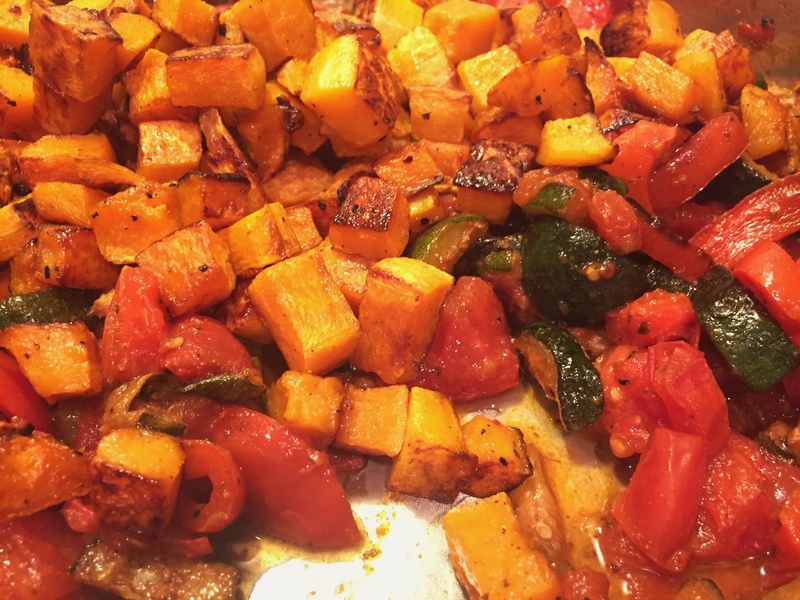 Just put the roasted squash in the fridge and then add it according to my recipe. It’ll heat through in no time. Every year I get hungry for Fall. Now I have another reason. 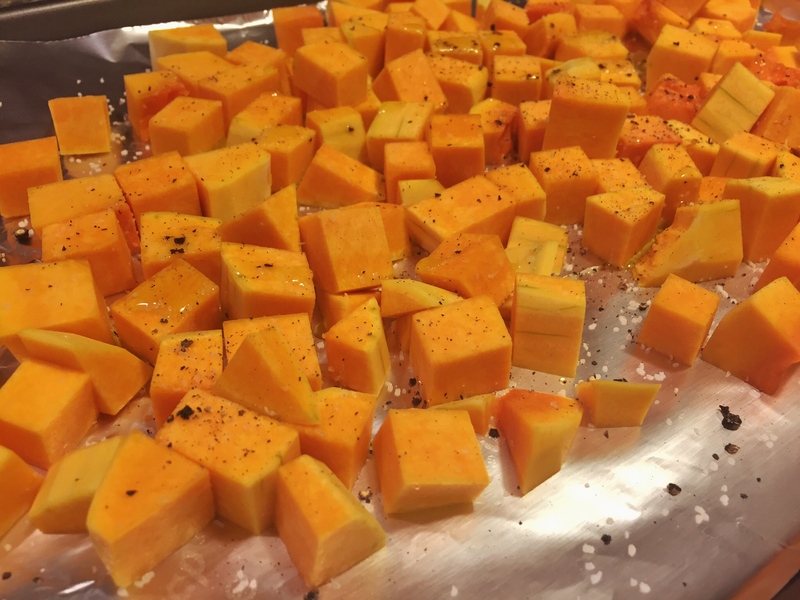 Tip: You could easily use pumpkin or acorn squash in place of the butternut squash. Use whatever you can find. 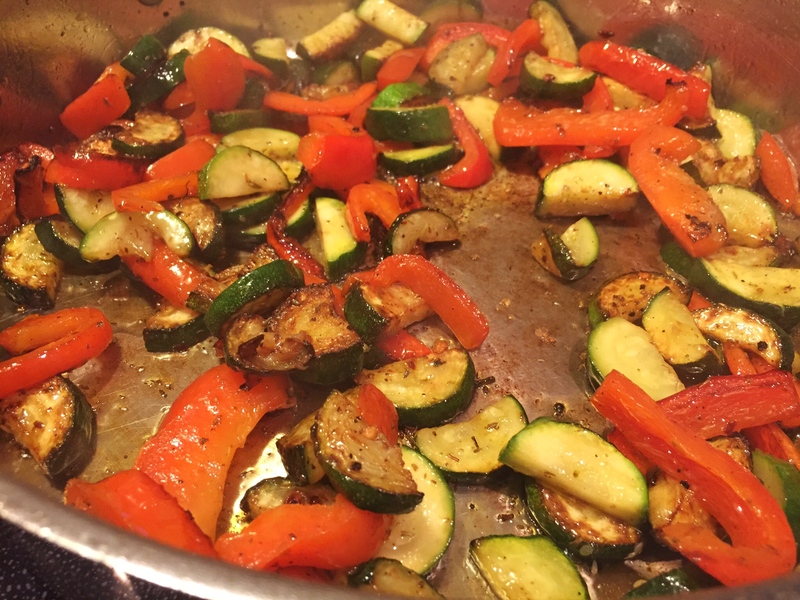 Don’t stop at zucchini and bell pepper. Try mushrooms, onions, or broccoli. You could also add sausage.